A coordinate covalent bond, also known as a dative bond or coordinate bond is a kind of 2-center, 2-electron covalent bond in which the two electrons derive from the same atom. The bonding of metal ions to ligands involves this kind of interaction. Formation of an adduct of ammonia and boron trifluoride, involving formation of a coordinate covalent bond. Coordinate covalent bonding is pervasive. In all metal aquo complexes [M(H2O)n]x+, the bonding between water and the metal cation is described as a coordinate covalent bond. Metal-ligand interactions in most organometallic compounds and most coordination compounds are described similarly. The term dipolar bond is used in organic chemistry for compounds such as amine oxides for which the electronic structure can be described in terms of the basic amine donating two electrons to an oxygen atom. This electronic structure has an electric dipole, hence the name di-polar bond. In reality, the atoms carry fractional charges; the more electronegative atom of the two involved in the bond will usually carry a fractional negative charge. One exception to this is carbon monoxide. In this case, the carbon atom carries the fractional negative charge despite its being less electronegative than oxygen. An example of a dative covalent bond is provided by the interaction between a molecule of ammonia, a Lewis base with a lone pair of electrons on the nitrogen atom, and boron trifluoride, a Lewis acid by virtue of the boron atom having an incomplete octet of electrons. In forming the adduct, the boron atom attains an octet configuration. The electronic structure of a coordination complex can be described in terms of the set of ligands each donating a pair of electrons to a metal centre. 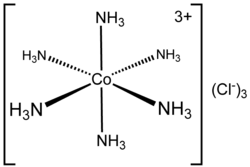 For example, in Hexaamminecobalt(III) chloride, each ammonia ligand donates its lone pair of electrons to the cobalt(III) ion. In this case, the bonds formed are described as coordinate bonds. In all cases the bond is a covalent bond. The prefix dipolar, dative or coordinate merely serves to indicate the origin of the electrons used in creating the bond. ↑ IUPAC, Compendium of Chemical Terminology, 2nd ed. (the "Gold Book") (1997). Online corrected version: (2006–) "dipolar bond". ↑ IUPAC, Compendium of Chemical Terminology, 2nd ed. (the "Gold Book") (1997). Online corrected version: (2006–) "dative bond". ↑ IUPAC, Compendium of Chemical Terminology, 2nd ed. (the "Gold Book") (1997). Online corrected version: (2006–) "coordinate bond".